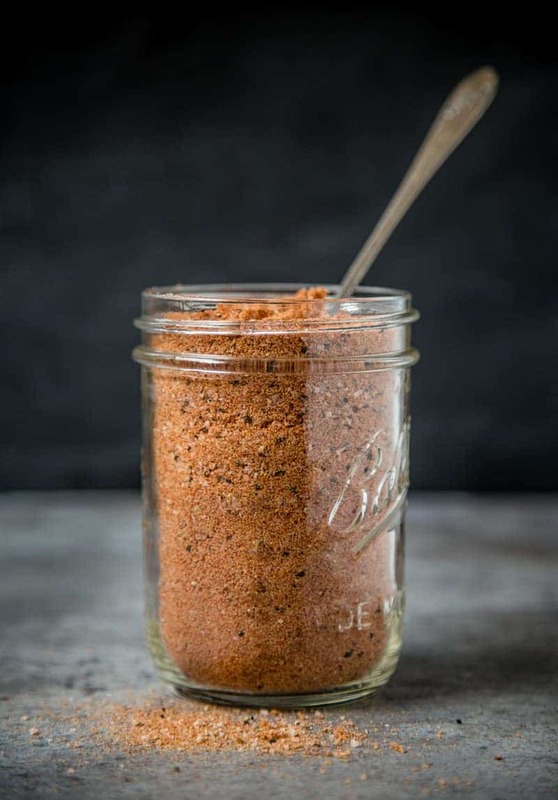 This homemade dry rub builds upon our our basic rub and adds more complexity and flavors to really provide a wow factor to your next BBQ pork recipe. We’ve posted pretty extensively on dry rubs before (see here, here, and here). One of our favorites is our Homemade Basic Dry Rub. 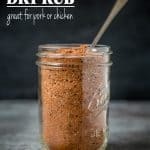 If you’re new to making dry rubs, I suggest you start there, then come here for this, more advanced, recipe. In that post we lay out the fundamentals of a good simple dry rub. If you want the basics, check out that post as it details the components of a great dry rub and how you can develop your own flavors, and why those work the way they do. 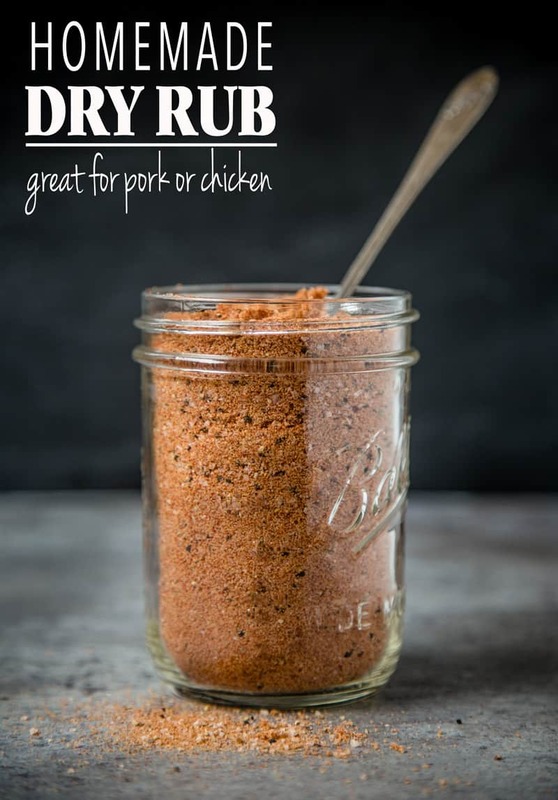 In that article we emphasize the components of a good dry rub for pork. Now EVERY single BBQ pro, chef, home cook, writer, grill master, pit master, you name it… will have their own take on a good dry rub. What it comes down to is finding a flavor profile that works for YOU. What Ingredients are in a Dry Rub? For us that’s a 1:1 ratio of Sugar to Everything Else. We take one part sugar (in this case use one cup to keep it simple). Then take part (one cup) and fill it with the other spices. Here’s a quick recap of what I mean. What are these other spices we use? Sweet: what we start with. 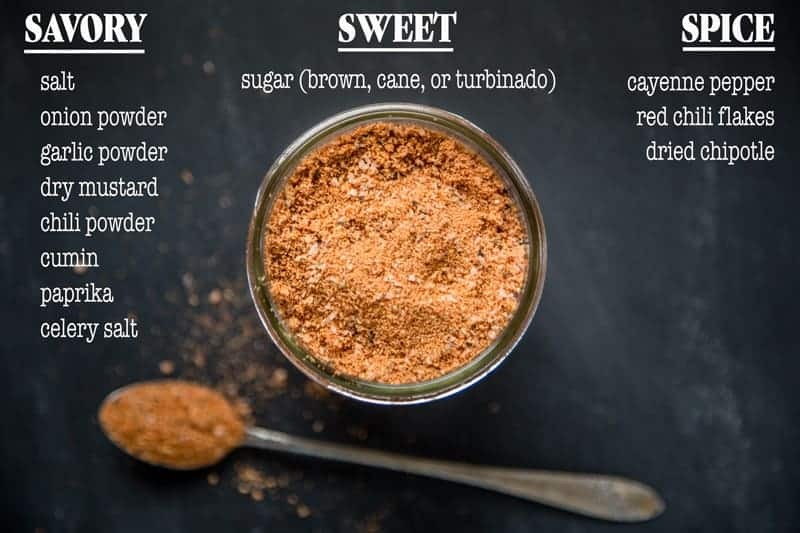 Brown sugar (dark brown or light brown), cane or turbinado. This will help to create a caramelized crusty exterior (bark). To balance the sugar, this is where the savory comes in. 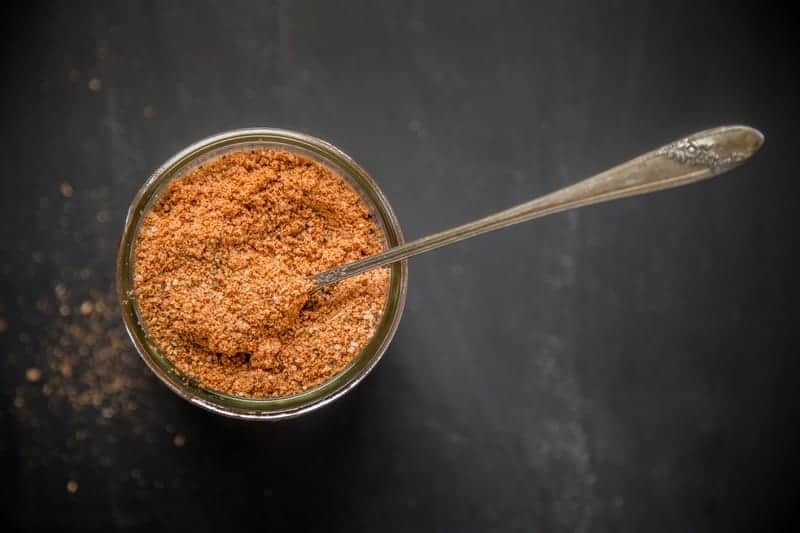 Savory: things like salt, onion powder, garlic powder, dry mustard, chili powder (which is simply a blend of dried chilies), cumin, paprika, celery salt, and more. Spice: cayenne pepper, red chili flakes, or dried chipotle. Add these slowly (like 1 teaspoon or tablespoon at a time). Don’t be nervous about adding spice! This will help balance the sugar (I promise!). Our Basic Dry Rub is quite simple (there’s only 4 ingredients in it). If you’re ready to do something with a little more flavor and punch we’ve got this one for you. I call it that because it’s truly the rub we use on most pork dishes. Though it works great for chicken too (as long as you’re cooking your chicken low and slow. Sugar will start to burn when you cook at a high temperature). This recipe builds upon our Basic Dry Rub and adds more complexity and bold flavors to really provide a wow factor to your next BBQ pork recipe. This yields about 2 1/2 cups. I know that's not the perfect 1:1 ratio. That ratio is meant to be a starting point. You start with that, then add to adjust flavors to your personal preferences. We love savory flavors, so go a little heavier on that S.
Make a large batch of this and you've got it ready to go all summer long. This will yield just over 2 cups of dry rub. Keep this stored in an air tight container and use throughout the summer on your favorite pork recipes. This sounds super simple for grilling novices like me! Love that the ratio makes it easy to customize the rub! Tried this on some smoked pork belly burnt end and it was delicious! I did however find it to be a bit on the salty side so I would recommend cutting the salt content down if that’s not your thing. Used on baked chicken breast. Soaked in water for 15-20 min with kosher salt, seasoned bottom. Spread butter on breasts and seasoned top. Baked at 375 for 22-25 min. Let rest covered and was super tender. The pre cook brine did it and this seasoning is the flavor i have been looking for!!!!! Smells almost like a chili seasoning but tastes much better than it smells! LOL awesome Andrew, thanks for the feedback!! I’m a newbie to Traeger Grilling and Pork is my favorite so far. This rub looks fab and I can’t wait to try it. Thanks Scott! And hopefully you can modify and experiment with your own rubs too! Great rub – thank you for the recipe. I brined a whole chicken overnight and then used this rub and smoked it for 5 hours. It was GREAT! My husband said it was the best chicken he’s had! I adjusted the recipe a bit by reducing the salt to about half to start, tasted it, and then added another tablespoon. Looking forward to trying it on pork! Excellent flavors! Awesome! Thanks so much for the feedback! !